There's nothing more spectacular than soaring through the sky while standing inside a basket of a hot air balloon. The breeze is refreshing and the scenery is incredible. If you’re smart enough to go during the fall, you're in for a treat because the fall foliage is remarkable. There are tons of places around the world where you can experience a once in a lifetime ballooning adventure. But during the fall you can sdmire fall foliage and the majestic colors it has to offer. 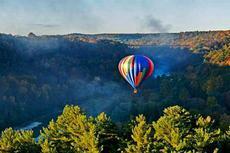 Fall ballooning festivals attract visitors from all over the world. Some of the best include the International Balloon Fiesta in New Mexico, the Carolina BalloonFest in North Carolina, the Poteau Balloon Fest in Oklahoma, and the Adirondack Balloon Festival in New York. Take a private trip with your significant other for a unique and romantic experience; gather your entire family together for some great bonding time; or join a group, make some new friends, and drift through the sky together. Spot a variety of wildlife, admire jaw-dropping mountains, view beautiful waterfalls, and appreciate the stunning landscapes. Here are the best places to go on a hot air balloon ride this fall.